I don't know why, but for some reason I have trouble keeping my grip on the bloody reins. My reins always seem to be too long, they slip through my hands, and I'm constantly adjusting them. Charlotte Dujardin has famously been quoted as saying "short reins win medals"! She is right. Long reins put your hands in your lap, encouraging you to collapse at the waist. 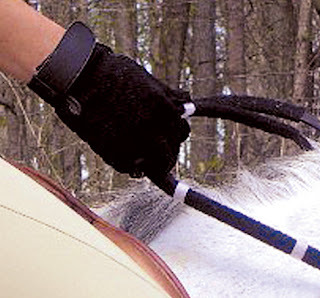 Long reins can cause a break in the line from hand to the horse's mouth and facilitate fiddling/busy contact. I've struggled with this problem for longer than I care to admit. I've tried reins labelled sure grip, rubber lined, and rubber "infused" reins. Nothing has helped. 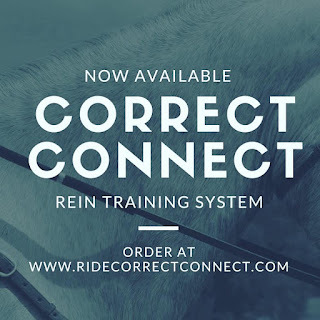 Last week, I tried the Correct Connect rein training system, which was developed by Olympic eventer Jill Hennenberg. I was searching Google for reins to improve grip, trying words like grippy, grip, rubber, stops, and finally, in desperation, I typed "velcro reins." And there it was, the web site for Correct Connect. My reins don't have the white stops -- there are several options. 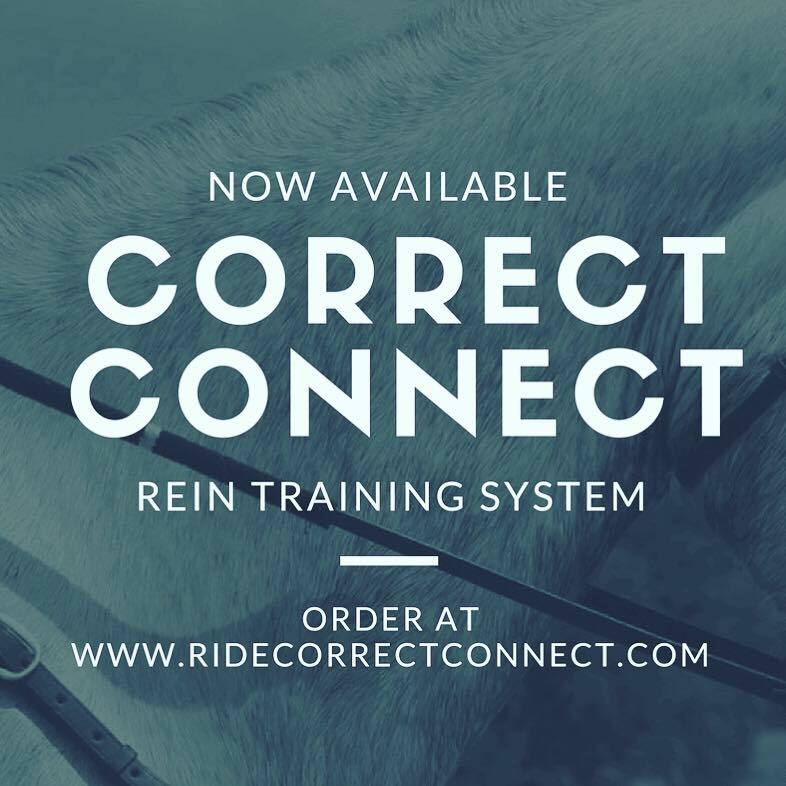 Correct Connect is a rein/glove system that offers the ultimate in grip -- the reins and gloves connect with a type of hook and loop system (aka Velcro). I thought it was genius, and the endorsements on the site had some big name trainers. The reins and gloves are about $100. 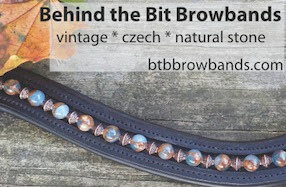 I messaged the site to find out the length of the reins, and they responded on a Sunday night in about 5 minutes -- 114." I ordered the classic black Kyle option on the spot. The Kyle reins are all black as opposed to the Original with white stops (shown left). I rode in them for the first time on Sunday. I decided not to try them in a lesson, but I wish I had. You know when you're having one of those feel-good rides, you wish your trainer was there? I loved looking in the mirror and seeing solid, quiet contact and Riley looking happy in the bridle, not bracing. Suddenly I was focusing on other things -- like my position, my seat, and my upper body's connection to my hands. I didn't take as many walk breaks. I could ride longer with Riley in a better balance. Riley had a better connection to the outside rein. I had a better sense of communicating with Riley, and could use my hands in a more nuanced way. I noted that when my hands are a little wider, Riley seemed easier to direct through my leg and seat. I read on the site that the reins are a little stiff at first -- something I did not really experience or notice. The gloves felt great, and I'm picky about gloves -- I like to be able to bend my fingers easily. Now I've only ridden in them once, and sometimes you try a gadget and have a honeymoon period. But many, many other times I've been disappointed from the start with a much anticipated miracle gadget. So this was a very pleasant surprise. The one "down side" I saw was that it is possible to ride with a more open finger and still keep your position on the reins -- you gotta have some discipline, after all. I don't know if you could ride in a show with these reins, but I'm pretty sure that's not the point of the Correct Connect system. The reins help you get the right feel, and understand the benefits of a steady, elastic hand. I also think that Riley is going to have more trust in my hands as I ride in these reins. Correct Connect will help you/me have that epiphany about the right feel and connection.